When cooler weather finally hits Texas I start thinking about soup. 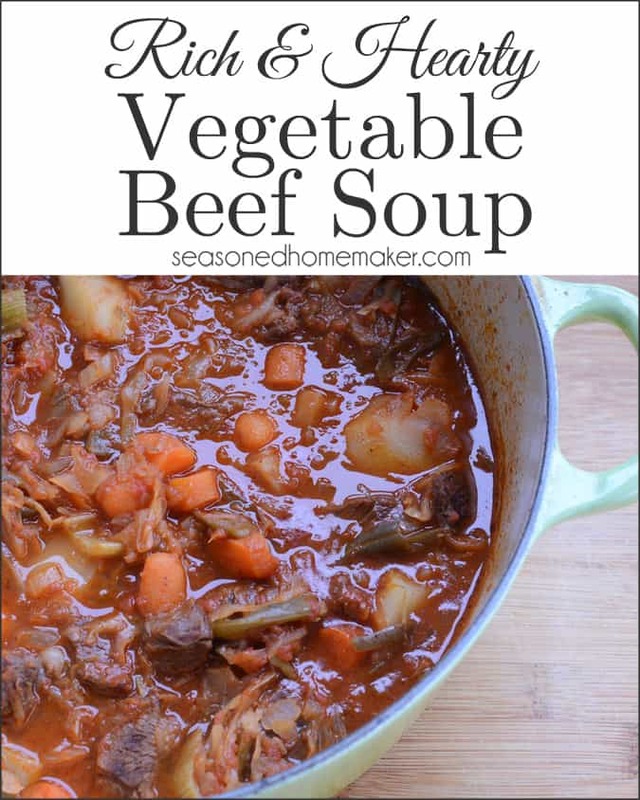 One of my favorites is a classic Vegetable Beef Soup. So classic, so simple, so delicious. Comfort food at its best. This recipe works well in a slow cooker or on the stove. I prefer slow cooking my soup on the stove because it warms up the kitchen and smells wonderful while it is cooking. 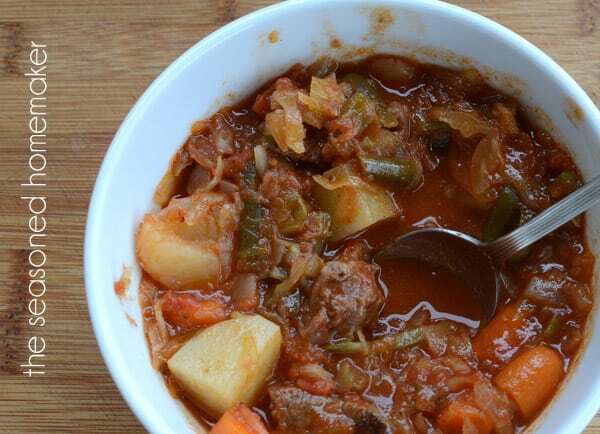 While this Vegetable Beef Soup recipe is almost perfect as is, every time I make it, it’s a little different. For example, I may leave out the green beans. Sometimes I’ll add half of the diced tomatoes. If I want to stretch it just a little bit further I might toss in a couple of extra potatoes. The recipe is in a printable form below, but I want to give you some instructions that I think make the soup so much better. 1. Cook your meat in the pot first. When you deglaze the pan it will create a more flavorful broth. 2. Use beef broth (preferably home made). Your soup will taste better and the broth will increase the nutrient value. 3. If you are into lacto-fermented foods, then ferment a bit of cabbage. I now keep a jar going in the fridge. Perfect for winter soups and stews.The cabbage will add flavor and is loaded with vitamins. 4. I like to simmer my meat for a bit before adding the veggies. The veggies cook really fast, but it takes a while to make the meat fork-tender. You will have to gauge this according to your stove. 5. If using a slow cooker it is best to brown the meat first. If time doesn’t allow for this then it will still be delicious if you toss everything in the slow cooker and then set it on low for 5-7 hours. In addition, this recipe gets even better if you own an Instant Pot Pressure Cooker (*affiliate). Next, use the saute function (medium) to brown the meat, then let it slow cook for about 30 minutes. Deglaze with the broth, add in the veggies, and slow cook on low for 5-7 hours. Here’s the best part – once it’s finished cooking it goes automatically goes to the Warm setting and stops cooking. It is the perfect temperature for serving. In a large dutch oven, brown stew meat in 1.5 T. Olive Oil. Do this in two batches. When the meat forms a glaze, deglaze with beef broth. Let meat simmer for 30 minutes on low. Pre-chop all of the vegetables and have them in a bowl. After meat has simmered, add vegetables to the pot. It is not necessary to pre-cook them. Add in Diced Tomatoes and beef broth. Stir until fully blended. Simmer until meat is tender and veggies are cooked. Adapted from Williams-Sonoma Hearty Vegetable & Beef Soup. I love soups and this sounds good. Thanks for sharing. It is so delicious I could eat it for breakfast! Hey, this soup looks really hearty, and just right for a cold winter meal! Yum! That is perfect for a snow day! Thanks for joining our Twirl and Take a Bow Party! Hope to see you again next week! This looks yummy! 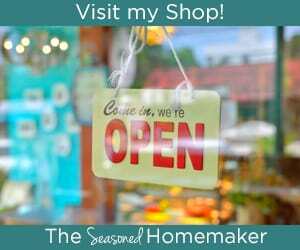 Thanks for sharing the recipe on the blog hop. This looks too yummy! And I love your robin’s egg blue pot! Beef soup is my favorite and yours looks so yummy. Definitely making this delicious soup – thanks for the recipe! Adding a couple bay leaves lends a much more savory flavor. I’ve made this soup both with and without .. with is always superb.